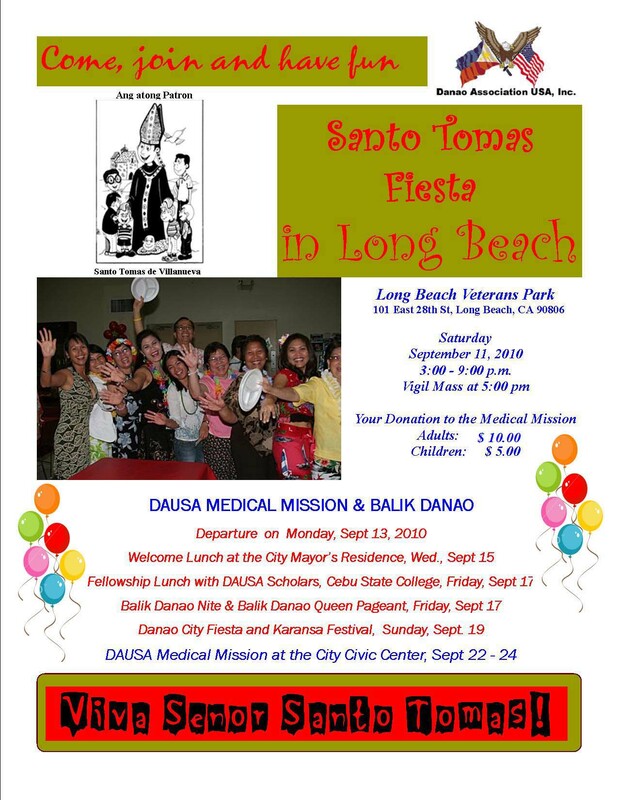 On September 11, 2010, Saturday starting at 03:00 p.m., members of the Danao Association, U.S.A. (DAUSA), their friends and relatives will observe and celebrate the feast of their hometown patron saint, the venerable Santo Tomas de Villanueva, Veteran’s Park Social Hall, 101 E. 28th Street, Long Beach, CA. We invite you to join us in the celebration of the Holy Eucharist jointly officiated by Rev. F. Ben Ilano and Fr. Johnny Planea. We want you to join us partake in a hearty lunch and share a good clean fun with Danawanons of Southern California. Being at this traditional yearly DAUSA event, we expect you to experience, like most of us, a gratifying feeling of self-fulfillment for doing a good deed, making a difference in the lives of some less fortunate brothers and sisters back home. DAUSA has been doing this, year after year, since 1998. It had assisted 3 children come to Los Angeles; two underwent extremely delicate life saving procedures. Please, come, join us, spend an evening with super friendly Danawanons honoring their patron saint and do your share in saving a life. Thank you and God bless. VIVA SANTO TOMAS!